Unexpected free night tonight, which means more metal! 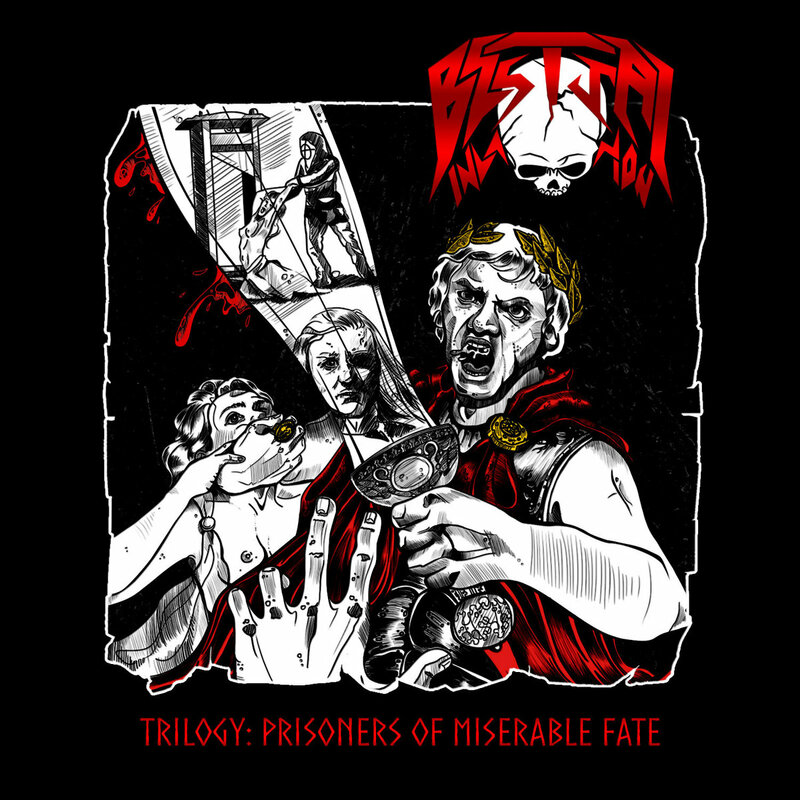 I've decided to check out Ukrainian thrash metal band Bestial Invasion and their 2016 EP "Trilogy: Prisoners Of Miserable Fate". They formed as a quartet in 2014, before going onto release a couple of singles and a split with Leeds thrashers Cryptic Shift a year later. They went through a couple of line-up changes and are now a quintet. They released a full-length last year, alongside this EP (released digitally by the band and on CD via Shellfire Attack Records) that features three songs. The CD version also features a bonus instrumental track. Bestial Invasion mix very fast technical thrash with elements of speed and power metal. The EP’s title-track features clean vocals, which at times venture into falsetto territory and screaming lead guitars. It’s quite an assault on the senses but it’s really enjoyable as well. After the intensity of the opening song, Zodiac: Crime World Mystery sounds altogether more majestic during the initial sixty-second intro. What follows is even more technicality and until the vocals kick in, they sound like a different band. It’s a strange experience listening to a band steeped in traditional metal values that also sounds so progressive and forward-thinking, but Bestial Invasion pulls it off in a bizarre way. Caligula: Salacious Age is equally as bewildering and frenetic. The band pulls off some breathtaking instrumentation here, just as they do across the whole EP. CD bonus song J.R.R. Tolkien: Lord Of Middle-Earth is a near-ten minute mostly-instrumental piece featuring samples and effects in places. Some might say it’s over the top but it makes complete sense for Bestial Invasion to have written it. It’s another insight into an eccentric but wholly exciting band. This is most definitely the case of another band smashing my expectations.